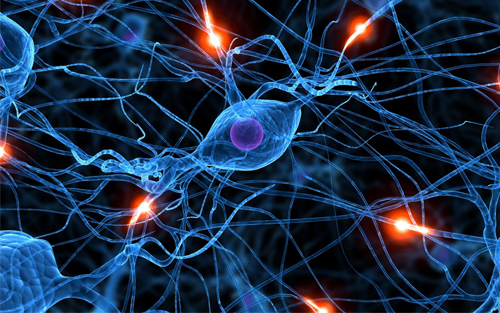 Chemical synapses are the predominant neuron-to-neuron contact in the central nervous system. Presynaptic boutons of neurons contain hundreds of vesicles filled with neurotransmitters, the diffusible signaling chemicals. Changes in the number of synapses are associated with numerous brain disorders, including Alzheimer’s disease and epilepsy. However, all current approaches for measuring synaptic density in humans require brain tissue from autopsy or surgical resection. We report the use of the synaptic vesicle glycoprotein 2A (SV2A) radioligand [11C]UCB-J combined with positron emission tomography (PET) to quantify synaptic density in the living human brain. Validation studies in a baboon confirmed that SV2A is an alternative synaptic density marker to synaptophysin. First-in-human PET studies demonstrated that [11C]UCB-J had excellent imaging properties. Finally, we confirmed that PET imaging of SV2A was sensitive to synaptic loss in patients with temporal lobe epilepsy. Thus, [11C]UCB-J PET imaging is a promising approach for in vivo quantification of synaptic density with several potential applications in diagnosis and therapeutic monitoring of neurological and psychiatric disorders.